Summary: From the beloved and bestselling memoirist comes a funny and affecting look at making the most of our friendships in an age of isolation. Klam relays a mix of brand-new and time-tested wisdom—she finds that longtime friends really can grow up without growing apart; that communication is key; that friendship is one of life’s great, free sources of happiness; that you’re not a friend, just a doormat, if you don’t get back what you give—and her discoveries range from amusing to deeply important. I can hardly believe that I've never read a book written by Julie Klam, but it's true. Even after kind of/sort of meeting her at a BEA party, I still hadn't picked up one of her books until FRIENDKEEPING:A FIELD GUIDE TO THE PEOPLE YOU LOVE, HATE, AND CAN'T LIVE WITHOUT arrived at my door. A funny book about friendship -- all of the ups and downs? I thought that might be what I need to get out of the cold weather/pre-holiday reading doldrums. 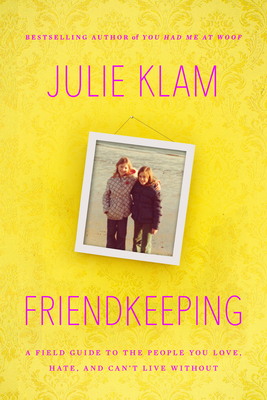 FRIENDKEEPING is basically Ms. Klam's personal advice book on all things related to friends and friendships. I have to admit when I started reading this book, I wondered what made Ms. Klam such an expert on friendship that she could write over 200 pages on the subject matter. (I told you that I'm in a bit of a funk right now!) However, I was quickly charmed by her intelligent insights and sharp wit. Moreover, I realized that she does have a grasp on friendship that I never could hope to have, and her advice is extremely sound. Never once did I feel she was preaching to me... and I think that was extremely critical to my enjoyment of this book. The book is organized in chapters by subject matter. For example, she writes about sharing secrets, how to handle a friendship with three people, how to cope with not liking your friends' significant others, how to keep up a long-distance friendship and much more. It's the chapter titles, though, that really impressed me... and made me laugh quite a bit. Just to give you a little sense of the author's sense of humor, here are some of the ones that made me chuckle: Don't Be a Drain, When the Dog Bites, When the Bee Stings, Missed Connections, and From @Friends to IRL. FRIENDKEEPING delves into all types of friendships from our childhood ones to our adult ones; and it even explores long-term and short-term friendships. However, I admit that one of my favorite chapters was on how online friendship has changed Ms. Klam's life. There were many parts of the book that I was able to relate to, but her thoughts on Twitter, Facebook, and other online social media communication were extremely close to my own. I loved her descriptions of the times she finally got to meet many of her on-line friends (or as my husband refers to them -- fake friends), and I have a feeling that many book bloggers will feel the exact same way. Another part of FRIENDKEEPING that I liked was how Ms. Klam described how much she's learned about relationships, and especially friendships, from watching how her young daughter Violet interacts with her friends. I loved Ms. Klam's stories about Violet, and even her own childhood; and I think being a mother has definitely enhanced Ms. Klam's ability to not only understand various types of friendships, but also how to be a better friend. Overall, I enjoyed FRIENDKEEPING a great deal and I think it's a fun read. It's an ideal gift this holiday season for all of the friends in your life! This sounds like a really valuable book to read! This sounds much better than I expected it to be. I was like you - I wondered how Klam could be an expert on friendships. I'll have to move this up my TBR pile. I have always said I am horrible at being a friend and need a 'how to'. I am going to get this book. I wouldn't think I needed advice on friendship but after reading your review I got all curious about this book. Friends are so important so who doesn't need a little advice on getting it right? I've read Julie's dog books, and I think what makes her so capable of writing such a book is her power of observation. We all probably know this stuff deep down inside, but she has a gift to see things with a very practical viewpoint. I can't wait to read this one. Oh I need to get to this. I have had some friend trouble this year that still upsets me. This sounds interesting...and relationships can always use a guide!